After I render I can't find the image anywhere. I have checked in the folder where the model is saved, then changed to custom and still no site when I choose to save it to the desktop. This has also happening the the V2 we have purchased at work. It would be handy if you could open the image directly from the podium rendering manager..
i created a folder on my desktop to house renders but they will not save there. If not, you need to configure Podium to run with Administrator privileges. Podium will render to any folder, but you need to manually enter the full path. Test with something simple like c:\temp first. The best thing for changing the default save folder is to copy the path from the address bar in Windows Explorer. Alternatively you can use the 'Send to clipboard as name' poverty for Windows. For the Mac it is probably easier to use something like Pathsnagger or an automator workflow. V2 uses a totally different render engine to V1.7, you will need to do some things differently, but we have videos and documentation to help. What issues are you having with lighting? Please bear in mind that we can help you more quickly and easily if you post images and tell us which preset you are using. as far as the save path goes, i did copy it straight from the properties window from another file in the directory so i know that the path name is correct. 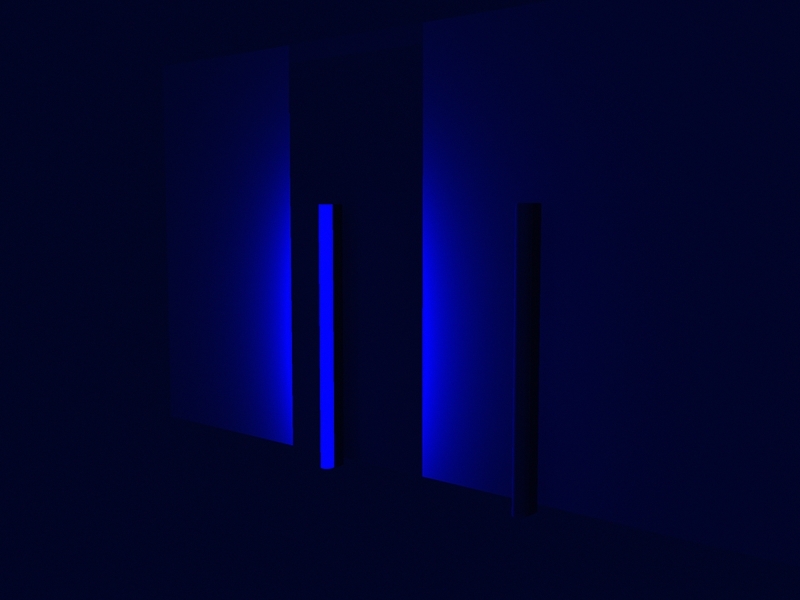 the image with the tube glowing on the right is a copy of the original model except i replaced the old 1.7 omnis with V2 point lights (in exactly the same place) assigned in the light properties panel to a light value of 3 and what i thought was a color of blue. 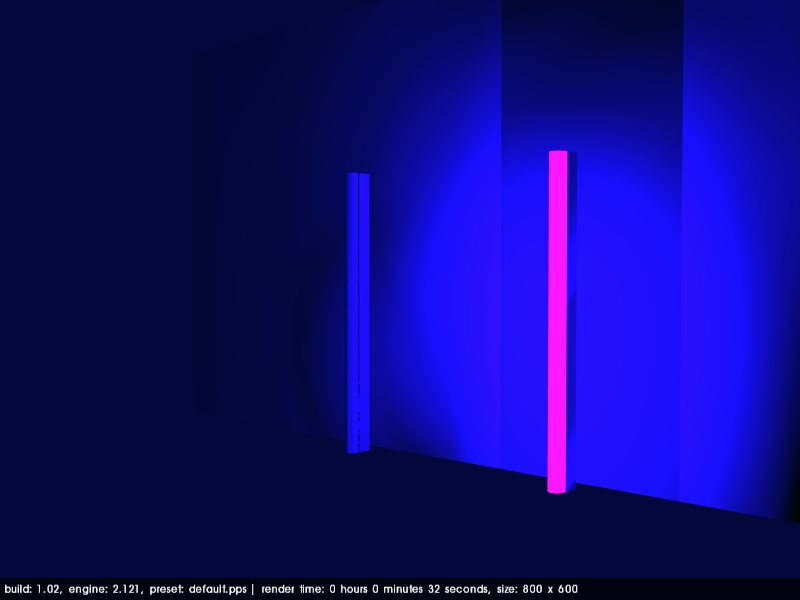 the color is not the big issue as that has to be futsed with anyway but the fact that the V2 render seems to ignore the fixture body blocking the rear spray of photons and the seemingly misplaced pools of light (the round one behind the fixture on the left) is hard to work around. i tried several different approaches to fixing this problem including making the light source an LEM, recessing the LEM, recessing the point sources, changing the way the fixture body textures face, making the fixture body sides and bottom filled volumes instead of just single planes, but all results seem to have this bleed. Copy the path from the Windows Explorer folder location bar (a bit like the IE URL bar) and paste it. Works perfectly for me each time. You need to post the model, I'm not sure what's going on here. For a linear light you are probably better off using a low intensity LEM. It is obvious that the omni power is much too high. any solution or is it just something that is just different in V2? Any save path will work as long as you don't have weird characters in it. the path above was an "example"
You might have to set SketchUp to have administrator privileges. Podium V2 does work very differently to v1.7. The only things that are the same (apart from the name) are the basic principle of keeping things as simple as possible to try achieve a high quality render with the very minimum of effort and jargon. Even the plant and lighting libraries don't work the same way. I have the same problem than you with my rendered image. I'm working on a hudge file like 20 Mo on sketchup. and i succed in render it after like 12 hours. But the image disappear and I would like to know where can I find it. I can see it on the OOPR windows so it must be somewhere. I try in temporary files but nothing, and, of course, I try in the model file and nothing too. It should be either in the last saved model location prior to initiating render or in custom folder if you selected that option. Did you by any chance render from portable drive?